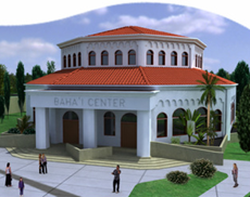 The Bahá’í Community Center is available to the community at large for meetings, celebrations and gatherings. A place to exchange ideas, share experiences, worship, meditate, reflect and walk the path of service together. The Bahá’í communities throughout beautiful Northeast Florida are, Jacksonville, St. John's County, Clay County, Fernandina Beach and Jacksonville Beach. Sanctuary will eventually be at the entrance.